Watching this right now...... Funny as you know what! I like this one. I think Stratford Johns is superb in it, Kenneth Cope's character is a real slimeball and Arthur is as always a joy to watch. This one really does show Ray has come of age and the 'jam tart' reference at the end always makes me giggle. James Warrior as D.S. Rogerson is back in this one and he's about the only old bill (since Taff perhaps) that really understands what sort of person Arthur is. I always think Minder has come full circle when I watch this one. Kenneth Cope appeared as Albert Stubbs in #1.2 'Bury My Half At Waltham Green' and they were outside Wormwood Scrubs. Here we are 15 years later, Kenneth Cope is back and they're outside Wormwood Scrubs. Purely coincidence? Probably, but we'll never really know. The next (final) episode follows this with Arthur being a hostage. Just watching this now.Echo the comments above,also,the magistrate deserves a mention.Some great Arthur material---with Dave talking about ringing a bell and running away is a prank and faint heart never won fair earner. Not sure the no plate would have been readable on that camera and one thing really bugs me is the way Kenneth Cope jots down the no plate after the 'Taxi' bumps him.Surely he already knew the number so said taxi driver knew who to pull out on.I would think Arthur would have smelt a rat when the taxi driver puts his hand up to it.Not in this world.. This episode is proof that the Ray years had episodes that matched the Terry ones. Another superb episode from series 10, it has been a top series and most episode are as good as anything from the Terry years. The Stratford Johns Character,Knowles came across as a right nasty piece of work and the superb Kenneth Cope has another appearance in Minder playing the slippery Phelan. A good storyline, helped along by the inclusion of the youths when Arthur was doing his community sentence, just helped lighten the mood of the episode, with Arthur wheeling and dealing as only he can in any circumstances, just brilliant. I wonder who Vera was though? Superb stuff and Gary Webster was really making his mark in the series by this point. A top episode. Stratford Johns is truly menacing despite being locked up. It's good to see Kenneth Cope again in Minder, this time as a total slime ball. By this point in the show Ray has a firm grasp of how things work in the world of Arthur Daley and it's nice that he's the one to set things in motion to save Arthur's hide. In this weeks Minder, someone is staging crimes and planting the evidence on Arthur. To solve the mystery Arthur and Ray pursue the trail back to the Great Willesden sorting office raid of 1970. The series is a Euston Films production for Central. 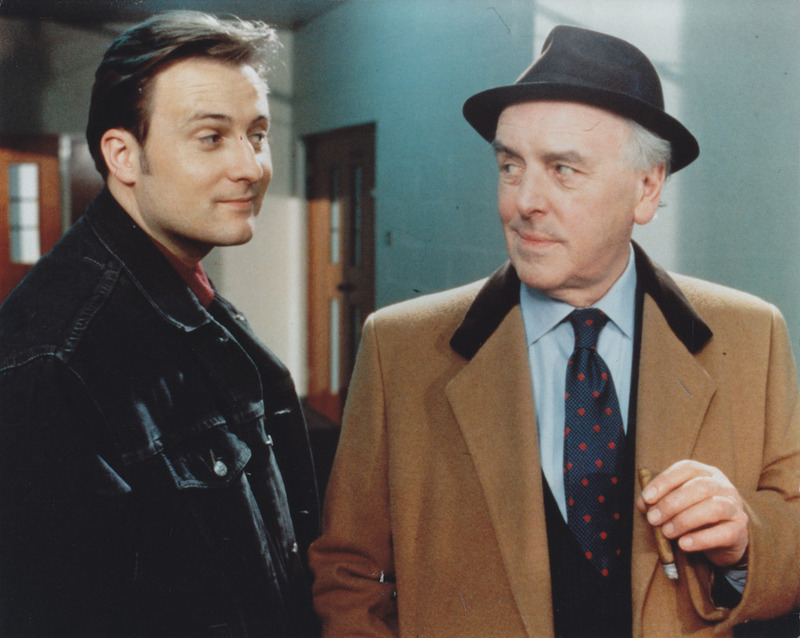 Picture: Ray (Gary Webster) and Arthur (George Cole). Like this. One of the better stories in the Ray era in my opinion. Charlie is a good menacing character, and even the copper does a good job of getting to the bottom of it, rather than just nailing Arthur. One odd bit of continuity that surprised me was when they were in the top of the lockup looking for the receipt of purchase. How come all that wasn’t destroyed in the fire in ‘A fridge too far’...? At a guess, only the fridges were damaged? It was a raging inferno. The lockup was destroyed I thought? Stratford Johns is really menacing in this but he doesn't look well at all. Very overweight. I might have mentioned before that the girl briefly seen in Kenneth Cope's pool room lair is a dead ringer for music journo/crime novelist Cathi Unsworth. Love to know whether it was her. Sean Harris is one of the community service kids and is on typically aggressive form - not such a big jump from here to Harry Brown and Red Riding? It's not - 100% confirmation from her. Thanks jno - good to have a man on the inside who can verify these things. LOL. ..probably not toecutter.good observation.